The Meraki MA-ANT-20 antenna is a dual-band, omni-directional antenna designed for use with Meraki APs that have N-type connectors. It is a versatile antenna with 360-degree coverage, having a gain of 4 dBi at 2.4GHz and 7 dBi at 5 GHz. The MA-ANT-20 is suitable for a broad range of applications. 2.4 - 2.5 GHz , 5.150 - 5.875 GHz. Dual-Band Omni Antenna (4/7 dBi Gain) Set. Support Details Full Contract Period. Cisco Meraki MR72 Cloud-Managed 802.11ac Outdoor AP. Cisco Meraki MR74 Cloud-Managed 802.11ac Outdoor AP. 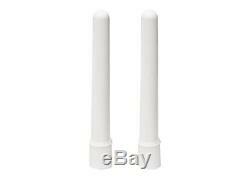 The item "Cisco Meraki Dual-Band Omni Antenna (4/7 dBi Gain) Set Antenna MA-ANT-20" is in sale since Friday, January 12, 2018. This item is in the category "Computers/Tablets & Networking\Enterprise Networking, Servers\Directional Antennas". The seller is "mdwirelesssupplies" and is located in Rockville, Maryland. This item can be shipped to United States, Canada, United Kingdom, Denmark, Romania, Slovakia, Bulgaria, Czech republic, Finland, Hungary, Latvia, Lithuania, Malta, Estonia, Australia, Greece, Portugal, Cyprus, Slovenia, Japan, China, Sweden, South Korea, Indonesia, Taiwan, South africa, Thailand, Belgium, France, Hong Kong, Ireland, Netherlands, Poland, Spain, Italy, Germany, Austria, Israel, Mexico, New Zealand, Philippines, Singapore, Switzerland, Norway, Saudi arabia, Ukraine, United arab emirates, Qatar, Kuwait, Bahrain, Croatia, Chile, Colombia, Costa rica, Dominican republic, Panama, Trinidad and tobago, Guatemala, El salvador, Honduras, Jamaica.